"Taiwan is a bit like the USA during the 60's. People are ready for it!" This is how Fink, the newest band turning heads in south Taiwan, describe the positive response from the crowd at May Jam a few months ago. All the more impressive is the fact that they signed up for May Jam just 2 weeks before the show, with a newly added vocalist and hardly enough material to fill 30 minutes of the 40 minute slot! With various backgrounds in - and an undeniable love for - music, Fink's sound is not what you would expect. A combination of Jazz, Blues, Reggae and Rock, they manage to make it all fit together in melodies that seem like they were there all the time, or should have been. It is music that appeals to all people, and tends to make you move. Their songs are mostly original, but look out for some (equally original) covers of Billy Jean and Led Zeppelin's Ramble On. 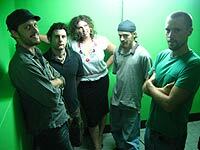 Fink (derived from 60's slang for gangsters in the UK) is a hard-working and committed bunch. "I have to play music," says Simon. "We got together and everyone just clicked musically," adds Kate. They spend most of their free time jamming, writing new stuff and setting up gigs. Their creative chemistry, combined with evident enthusiasm, is paying off as they seem to gain a larger fan base each time they get up on stage. Their next goal is to put together a few songs in Chinese. As a band that came together in Taiwan, they are adamant about getting people together and enjoying the music as much as they obviously do. Womb Bloc is located at 67, JhongJheng 2nd Road, on the 3rd floor of La Cafe Strada. For more information, contact Chloe at 0912-712-602. 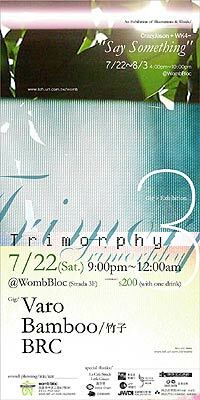 Saturday, July 15th - SenseOrgan's 3rd anniversary party at Womb Bloc. Includes several featured DJ's. Entrance is NT$250, includes drinks. July 22nd to August 3rd - local artists CrazyJason and his friend WK4 will exhibit their artwork/illustrations. Opening night (the 22nd) will feature live performances from 3 indie bands: Varo (former members of Ladybugs from Taipei), Bamboo, and BRC (both from Kaohsiung). Admission for the live show is NT$200, includes drinks. Catch Fink on July 15th at The Armory in Tainan. Visit www.armorypub.net for more info.